From left: Khyla Russell, Hinerangi Ferrall-Heath, Kyle Davis, Helen Brown, David Higgins, Takerei Norton and Matapura Ellison at a Cultural Mapping wānanga. Eight years into the Ngāi Tahu Cultural Mapping project, over 5,000 Māori place names have been recorded and Te Rūnanga o Ngāi Tahu Archives Manager Takerei Norton hopes to have a public website up and running by the end of 2016. “Initiated to record Ngāi Tahu history on a tribal platform for Ngāi Tahu whānui, it’s a unique and innovative programme that emphasises the importance of our history and making sure our people have greater access to it,” says Takerei. He says it is a vital resource for the tribe – one that has never been created before – and he believes it will become a model for other iwi and indigenous people throughout the world. Takerei says there is on-going demand from both within the iwi and from the wider public, for information about local Māori history and he says the Cultural Mapping project will go a long way towards addressing that. The mapping project grew out of work undertaken by Kaupapa Taiao, the former Ngāi Tahu environmental unit, in the early 2000s to protect Ngāi Tahu values on high country stations through Tenure Review. “We began mapping cultural values to give us a greater guidance on where our cultural values are in order to give us a greater chance of protecting them. 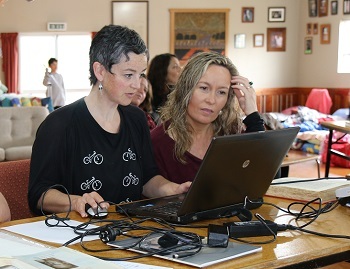 Helen Brown and Paulette Tamati-Elliffe at a Cultural Mapping wānanga at Puketeraki. He says that this huge resource is really the foundation of the Cultural Mapping Project. The Ngāi Tahu Cultural Mapping Project uses the latest Geographical Information System (GIS) technology to record, map and transmit traditional Ngāi Tahu knowledge. 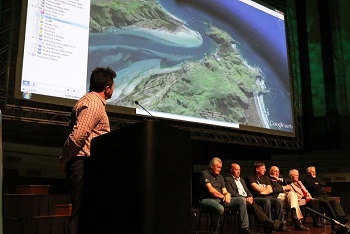 With the aid of GIS technology, the stories and place names that record Ngāi Tahu history in Te Waipounamu are being mapped onto a virtual landscape for future generations. GIS integrates computer technology for capturing, managing, analysing and displaying all forms of geographically referenced information. It allows the user to view, understand, question, interpret and visualise data in many ways that reveal relationships, patterns and trends in a variety of mediums. Ngāi Tahu place names, traditional travel routes, Māori reserved land and other areas of cultural significance are examples of the knowledge that is being recorded. In essence the GIS tool is where relationships can be analysed and then visualised in the form of maps. The system allows layers of information to be laid over the land, bringing the information to life and giving it greater context. Ngāi Tahu Archives Manager Takerei Norton presents the Cultural Mapping project at Ngāi Tahu Hui-ā-Iwi in Dunedin in November. In conjunction with the mapping of cultural values is the development of a reference-based system guided by kaumātua and marae representatives to ensure the authenticity and integrity of information. Although the GIS technology is critical to the project, the heart of the work is carried out in the field, visiting sites and collecting the histories of Ngāi Tahu. Sometimes cultural sites have been incorrectly mapped, but by using mobile GIS devices in the field to record the knowledge of local people, the locations of these cultural sites can often be corrected. Takerei says the Cultural Mapping project is going to help to bring Ngāi Tahu history to life.